These days, working and writing life involves angling or angling-related projects. 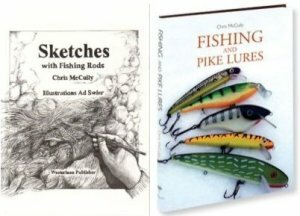 Chris’s fishing books: an overview. 2013 (with Ken Whelan and James Sadler) Irish Sea-trout: Nomads of the Tides. Ellesmere, Shropshire: The Medlar Press. 2011 Outside. Uig, Lewis: Available from The Two Ravens Press. 210pp. ISBN 978 1 906120 57 3. pb. I'm lucky enough to publish some work each year in that fine UK angling magazine Trout and Salmon, and have been associated with T&S for what are becoming rather many years. I was also proud to publish occasional articles in Waterlog. Those two journals were - and in the case of Trout and Salmon still are - an important part of my angling life, though like all its readers I grieve the passing of Waterlog. While I've fished for trout and grayling for nearly fifty years - good Lord, nearly fifty - I enjoy trying to catch many different species of fish and always enjoy using a variety of angling methods. When I lived in Holland I spent a great deal of time fishing for pike - with streamers, jerkbaits, softbaits, spoons and spinners - and came to have a great respect for them. These days, having relocated to England, I'm enjoying winter long-trotting for grayling, roach, dace and chub. Fly-fishing and fly-dressing are still important to me, of course, and in coming years I'm looking forward to returning to some English stillwaters to try conclusions with brown and rainbow trout. I love fishing some of the chalkstreams for brown trout and grayling and I also try to get back as often as possible to Yorkshire (to fish for wild brown trout and grayling) and to Ireland (sea-trout and brown trout). Very recently, too, I've become interested in the sea angling to be found on and around my local coasts. If you're interested­ in finding out more about these fishing activities please visit the Fishing diary and details of current Fishing projects.